Quick Take: V, "Red Rain"
V returned with not a lot happening, and I wish they'd plug those plot holes. (S0201) To be perfectly honest, not a lot happened in the second season premiere of ABC's V this week. After the huge developments and cliffhanger last spring, it was a remarkably tame episode. Not one person died or had their life really even threatened. No shots were fired; nothing blew up. The worst thing that happened was when Tyler (Logan Huffman) got a little bump on the head during a would-be riot, which quickly calmed down. That doesn't mean it was a bad episode, but I honestly expected more excitement. Anna (Morena Baccarin) continues to battle human emotion, sparked when Erica (Elizabeth Mitchell) destroyed all of her solider eggs in the season finale. Some of the ships' captains, and especially Marcus (Christopher Shyer), seem to have noticed the slip, though Anna denied the feelings were real or had a significant impact on her. What I find curious is, if Anna is so easily affected, why doesn't she suspect more of her people are? The whole 5th Column came about because Visitors started to sympathize with humans. Now that Anna has seen just how easy it is to lose control, she shouldn't be asking how some of her people did the same, but why didn't more of them? In fact, she doesn't ever have even appeared to consider seriously that her daughter, Lisa (Laura Vandervoort), is more than just play acting her relationship with Tyler. That is merely one of the plot holes in the series. Plot holes are probably the number one mistake V makes. The acting is good, even Vandervoort, one of the best on V, whom I found lousy on Smallville. The special effects look fantastic. The drama builds just fine. Real action and danger play out wonderfully. But then there are these major aspects that just don't make sense. Let's look at more examples. Chad (Scott Wolf) has decided to join the human resistance against the Visitors. 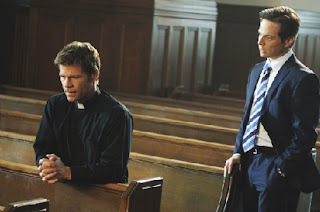 Sure, Jack (Joel Gretsch) is hesitant to let Chad know too much about the secret group, but he is given membership by the end of the episode. Besides that, Chad ignored plenty of evidence right in front of his face before, but seeing a human get pricked with some needles, and interviewing a few more who went through the same thing, but not even finding out why the Visitors were doing the pricking, swayed him? Based on his character as shown up til now, he should have asked Anna what the purpose of the pricks were, and if he couldn't get to her, assumed that they were something helpful. I didn't see a great reason for his sudden change of heart. Lastly, I thought the twist of Anna letting Ryan (Morris Chestnut) go and keeping his baby so that she could control him, a major terrorist (from her perspective), down the road, was a good move. It was a nice story that made sense. But Hobbes (Charles Mesure) figured out Anna's real motivation immediately, and no one paid him much attention when he pointed it out. Maybe they believed him, but just couldn't see any way to get around Anna's game. That would have been fine, if they took a moment to say that. Instead, viewers are left confused at why nobody cares Anna has a potential mole in their group. The episode wasn't all bad. Dr. Sidney Miller was introduced to the cast, as the 5th Column's newest member. Though he wasn't given a choice about membership, and despite his obvious hesitation to join up, he also didn't argue much. Miller is played by Bret Harrison, who I thought hilarious on both The Loop and Reaper. I'm glad to see him get some more work, and hope he sticks around. The series would benefit from some of his brand of humor. I'm not sure why I like V, given the obvious flaws that run rampant within the series. There is still something about it, perhaps the underdog fight to save the world, that is appealing. As I mentioned, perhaps it's the actors themselves, who really commit to the material, even when it's not up to par, which is often. For whatever reason, I hope V sticks around long enough to fix those issues. And given that the show is beginning Season Two just as screwed up as Season One was, let's hope the people making the show realize there are issues that need to be fixed. V airs Tuesday nights at 9:00. on ABC, including tonight. Jerome Wetzel also writes TV reviews for Examiner and BlogCritics. He is an avid TV fan, and wants to cover as much as possible. He has written fiction, as well, and is currently working on his series, An Actor's Nightmare. Great job this Jerome! You've done a perfect job at illustrating my own dilemma with this show -- great in parts but the whole (particularly the plot holes as you've stated) lets us down significantly thus far. Great cast, sets, special effects, and occasional cool moments can only take us so far. That said, totally agree on Brett Harrison. Reaper was such a great show, so sad that it was cancelled so early still.